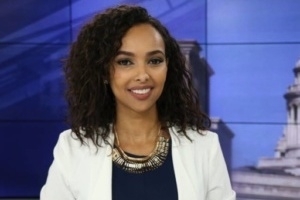 Haweya Fadal, (SOC/MA '16), is making a name for herself in Canada as a video journalist for CityNews Edmonton. "The most exciting part about this is that it's a whole new operation," Fadal says. "Before our newscast launched…CityNews was only in Toronto. So we're the new kids in town and the whole team here gets to be part of phase one of the national expansion with CityNews." After graduating from the Journalism and Public Affairs MA program, Fadal got her start as part of the WMTV team in Madison, Wisconsin as a Reporter/Producer for NBC15 News and CW News at 9. She quickly moved on to become an integral part of CityNews' national expansion in Canada. She credits SOC with giving her the knowledge and skills to take advantage of opportunities immediately after graduation. "AU gave me my foundation for everything from news writing to shooting to editing," Fadal says. "I learned something from every single one of my professors that I use in my daily work as a reporter. From writing concise on-air scripts, to editing, to even operating a camera." She was particularly grateful to her Reporting on Public Affairs class, where she says she learned congressional reporting and how to produce on strict deadlines. Her advice to current students is to soak up everything that SOC has to offer, and not just go through the motions to fulfill requirements. She also says summer internships were the most helpful in getting her to her current position.